This review contains notes for the teacher on concepts to review for the AP test. 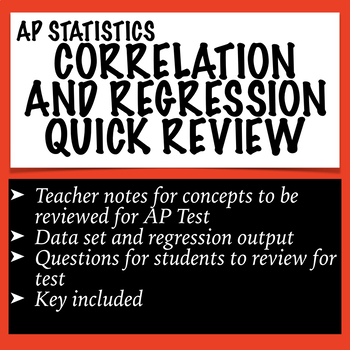 I will be creating more of these quick reviews for the AP test covering descriptive statistics, probability, experimental design, and inference. All rights reserved. All products purchased from Angela Hogan (StatsWithHogan) may be used by the purchaser for their classroom use only. No part of the publication may be reproduced, distributed, or transmitted without written consent of the author. This includes posting the product on the Internet in any form, including classroom and/or personal websites, social media, or network drives. If you would like to share this product with your team or colleagues, please purchase additional licenses from my store at a discounted price.